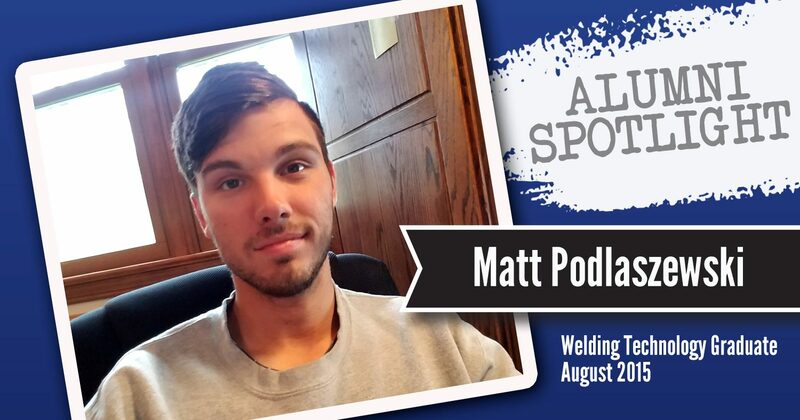 Matt Podlaszewski graduated from Penn Commercial Business/Technical School in August 2015 from the Welding Technology program. His education here, which he was able to complete in under one year, allowed him to achieve his goal of getting a great job in the trades. Right out of high school, however, Matt originally went to Mercyhurst University to major in Biochemistry. He quickly discovered that it was not the experience he had anticipated. Although he enjoyed the sciences in high school, when he got to college it was quite different. He discovered it was not something he was excited about learning anymore. A career in Biochemistry was no longer something Matt thought he could do for the rest of his life. With this realization, he transferred to his local community college for a year to figure out what exactly he wanted to do. One day Matt’s mother handed him a newspaper. There was an article discussing Penn Commercial Business/Technical School’s re-opening of their learning technology program and it immediately sparked Matt’s interest. He decided to go for a visit, took a tour, and instantly decided this was the place for him. Once Matt graduated from Penn Commercial he obtained a position in a small, family-owned shop where everyone was very personable. Now, however, he is transitioning into a new role with United Steelworkers. Matt is incredibly excited about this new opportunity which offers fantastic benefits and the opportunity to grow and make more money. Matt remains incredibly grateful for the experience he had at his previous job. “I learned so much from the small shop. I had to do a little bit of everything. At first I started welding and then at the end of my time there I was doing a whole bunch of other stuff also.” His first positon laid the groundwork for his career in welding, but working in the steel workers union will definitely be a different experience. As Matt explained, “My last job was about twenty to twenty-five workers in the shop and now I am going to a building over one million square feet.” Overall, Matt says the best thing about his career is that there is always something new to learn and new problems to solve. With a great sense of humor, he explains it in a way we can all understand, “You think you’re the man, you think you have it all figured out and then you get stumped. Then you think oh, I am not the man.” In other words, there is a great deal of problem solving and your days will usually not be the same. It keeps you humble and your work exciting. You can read here to learn about salaries and the extensive career opportunities available for welders.